Calculate power in fluid flow. where is the height dropped by the water. This is simply a kinematic equation for any object falling a distance with negligible resistance. In fluids, this last equation is called Torricelli’s theorem. Note that the result is independent of the velocity’s direction, just as we found when applying conservation of energy to falling objects. Figure 1. (a) Water gushes from the base of the Studen Kladenetz dam in Bulgaria. 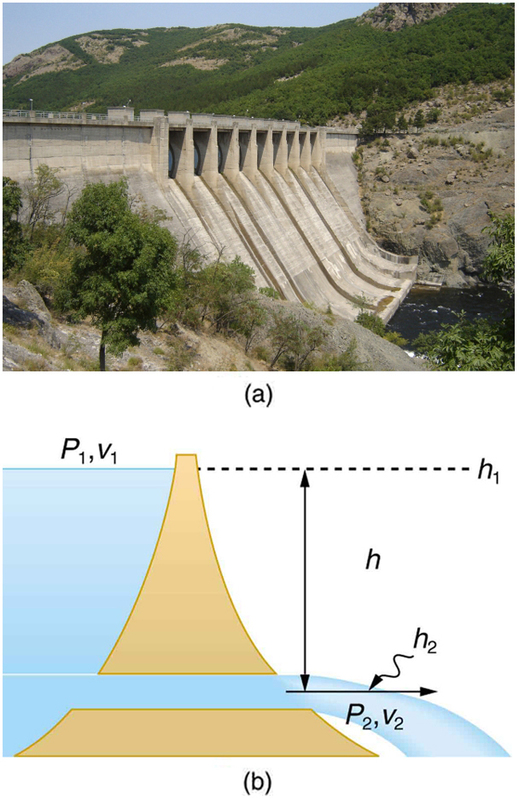 (credit: Kiril Kapustin; http://www.ImagesFromBulgaria.com) (b) In the absence of significant resistance, water flows from the reservoir with the same speed it would have if it fell the distance h without friction. This is an example of Torricelli’s theorem. Figure 2. Pressure in the nozzle of this fire hose is less than at ground level for two reasons: the water has to go uphill to get to the nozzle, and speed increases in the nozzle. In spite of its lowered pressure, the water can exert a large force on anything it strikes, by virtue of its kinetic energy. Pressure in the water stream becomes equal to atmospheric pressure once it emerges into the air. Fire hoses used in major structure fires have inside diameters of 6.40 cm. 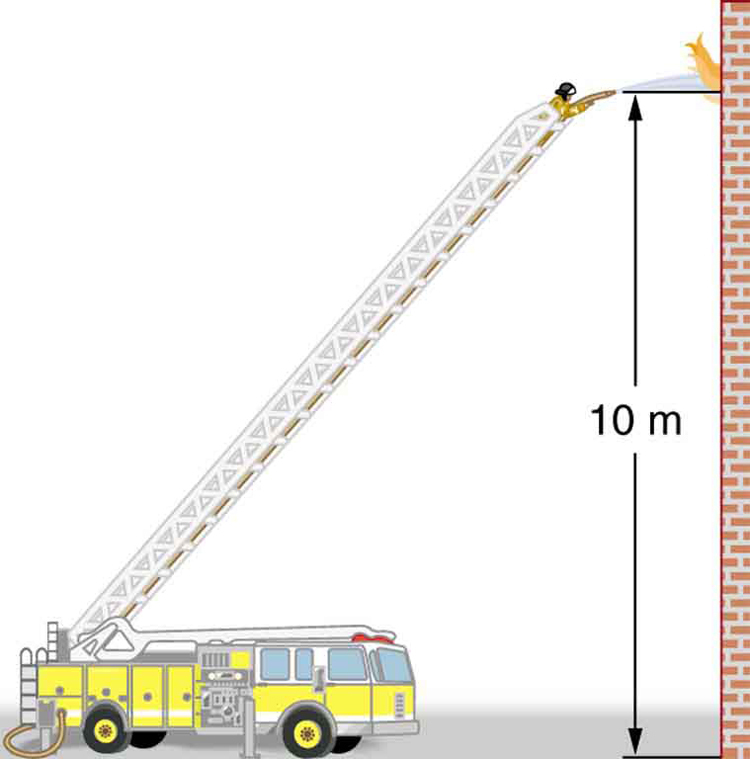 Suppose such a hose carries a flow of 40.0 L/s starting at a gauge pressure of The hose goes 10.0 m up a ladder to a nozzle having an inside diameter of 3.00 cm. Assuming negligible resistance, what is the pressure in the nozzle? Here we must use Bernoulli’s equation to solve for the pressure, since depth is not constant. This value is a gauge pressure, since the initial pressure was given as a gauge pressure. Thus the nozzle pressure equals atmospheric pressure, as it must because the water exits into the atmosphere without changes in its conditions. Each term has a clear physical meaning. For example, is the power supplied to a fluid, perhaps by a pump, to give it its pressure Similarly, is the power supplied to a fluid to give it its kinetic energy. And is the power going to gravitational potential energy. Power is defined as the rate of energy transferred, or Fluid flow involves several types of power. Each type of power is identified with a specific type of energy being expended or changed in form. Suppose the fire hose in the previous example is fed by a pump that receives water through a hose with a 6.40-cm diameter coming from a hydrant with a pressure of What power does the pump supply to the water? Here we must consider energy forms as well as how they relate to fluid flow. Since the input and output hoses have the same diameters and are at the same height, the pump does not change the speed of the water nor its height, and so the water’s kinetic energy and gravitational potential energy are unchanged. That means the pump only supplies power to increase water pressure by (from to ). Such a substantial amount of power requires a large pump, such as is found on some fire trucks. (This kilowatt value converts to about 50 hp.) The pump in this example increases only the water’s pressure. If a pump—such as the heart—directly increases velocity and height as well as pressure, we would have to calculate all three terms to find the power it supplies. Power in fluid flow is given by the equation where the first term is power associated with pressure, the second is power associated with velocity, and the third is power associated with height. 2: Water that has emerged from a hose into the atmosphere has a gauge pressure of zero. Why? When you put your hand in front of the emerging stream you feel a force, yet the water’s gauge pressure is zero. Explain where the force comes from in terms of energy. 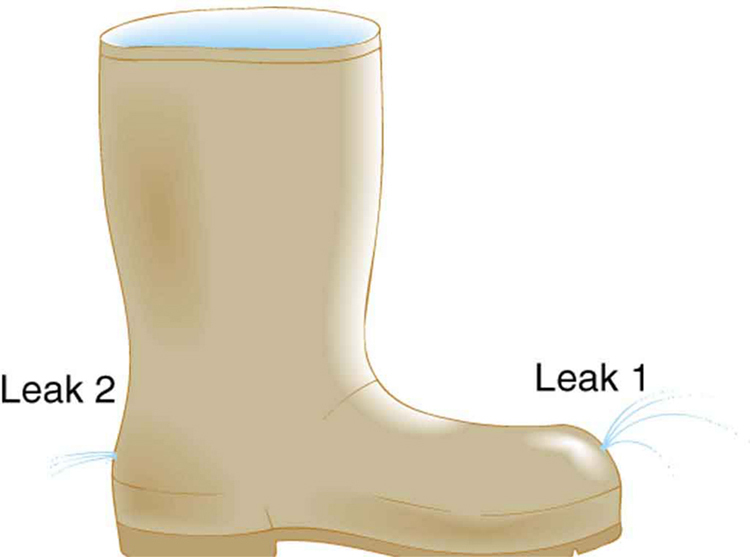 3: The old rubber boot shown in Figure 3 has two leaks. To what maximum height can the water squirt from Leak 1? How does the velocity of water emerging from Leak 2 differ from that of leak 1? Explain your responses in terms of energy. Figure 3. Water emerges from two leaks in an old boot. 4: Water pressure inside a hose nozzle can be less than atmospheric pressure due to the Bernoulli effect. Explain in terms of energy how the water can emerge from the nozzle against the opposing atmospheric pressure. 1: Hoover Dam on the Colorado River is the highest dam in the United States at 221 m, with an output of 1300 MW. The dam generates electricity with water taken from a depth of 150 m and an average flow rate of (a) Calculate the power in this flow. (b) What is the ratio of this power to the facility’s average of 680 MW? 3: The left ventricle of a resting adult’s heart pumps blood at a flow rate of increasing its pressure by 110 mm Hg, its speed from zero to 30.0 cm/s, and its height by 5.00 cm. (All numbers are averaged over the entire heartbeat.) Calculate the total power output of the left ventricle. Note that most of the power is used to increase blood pressure. 4: A sump pump (used to drain water from the basement of houses built below the water table) is draining a flooded basement at the rate of 0.750 L/s, with an output pressure of (a) The water enters a hose with a 3.00-cm inside diameter and rises 2.50 m above the pump. What is its pressure at this point? (b) The hose goes over the foundation wall, losing 0.500 m in height, and widens to 4.00 cm in diameter. What is the pressure now? You may neglect frictional losses in both parts of the problem. 12.3 The Most General Applications of Bernoulli’s Equation by OpenStax is licensed under a Creative Commons Attribution 4.0 International License, except where otherwise noted.